Meroni manufactures a brilliant yet competitively priced alternative to drawer and cupboard/cabinet security that operates easily for use in high turnover vocations, like sales offices, car dealerships etc, where sales people often move offices/desks sometimes more often than normal. Enter the Meroni 10 series resettable combination lock system. 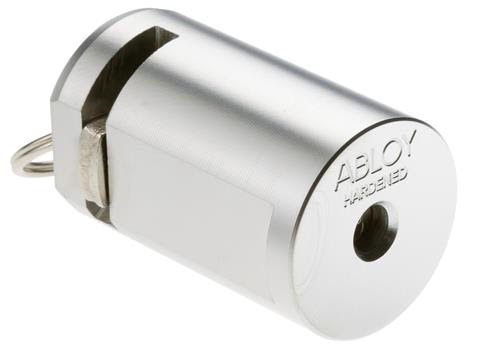 The product can be typically used to replace existing cam and file cabinet locks (with a little installation modification) or are fast becoming a sought after alternative to office furniture and cabinet/drawer manufacturers, where their customers are requesting combination locks on sales persons desks and cabinets/drawers. This product uses a fully resettable mechanism to enable the manager to access a lost combination using an overide key and reset tool. This means that if a user relocates or leaves the position, the desk drawer/cabinet can be easily reset and used by the next occupant without the need to have new keys cut to code or locks replaced. The obvious benefits include cost savings, time and convenience for managers and reduced down time. The brochure in the source below is in Italian, but shows how the system is easily reset by the manager. The products are available with operating keys too and can also be master keyed if desired. Cost effective, unique products aimed at minimizing productivity down times and maximizing efficient management use, that actually save money while providing superior convenience. Meroni, the famous Italian manufacturer of stylish and purposeful locks and access control products continue their long tradition of classic yet noveau design expertise with products aimed at making the cabinet makers life simpler and more profitable. This product is designed to be installed in typical wooden drawers and whereas it's simplicity of design and it's ease of use/operation is radically different from competitors offerings, it's price point, combined with it's ease of installation and the ultra-competitive pricing, separates it from it's competitors offerings. The benefit of this offering includes various length locking bars, that can offer cabinet makers and drawer lock installers an edge where competing products fail. The technical drawings below offer an interpretation of the use and the easy installation. The technical relief drawing here, shows measurements of the lock. 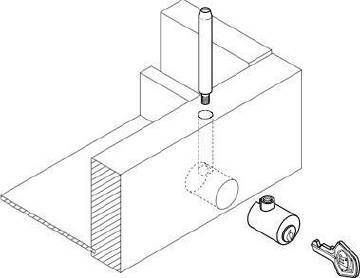 The application drawing here shows how the product is installed and used. Rather than having a hole drilled right through a drawer, you simply drill a hole about half way through your material. Drill a hole for the bolt mechanism to line up with the connection to the lock mechanism, screw the bolt to the lock and that's it. Simply drill the strike hole in your furniture/cabinet/drawer frame and the installation is complete. This means no screws are needed to be used at all. Available keyed separately, keyed alike, master keyed and keyed alike in groups, the product is available in minimum groups of 20 units. Available in Pickled Brass (US4) or Nickel Plated Brass (US14) and comes with a collar to protect the external hole (and cover a wayward hole). As the North American distributor for the whole range of Meroni lock and access control products, we can usually provide requested orders within about 4 weeks. With the currency conversion rates at their cheapest in many years, owning high quality European manufactured products, usually reserved for higher-end products is now within further reach of discerning customers. We recently stocked up on this fabulous product to answer wildly increasing demand. The recent update to the product, allowing it to also work on 45mm (1-3/4") thick doors, has seen sales increase as we expected. The demand from discerning customers, expecting high quality product for the value is being met and this is shown by our regular need to keep expanding out inventory. Remembering that many manufacturers continue to increase prices for in-demand products, often due to volatile exchange rates, raw material cost increases and of course the cost of oil, we see fit to maintain our list price of this product at US$128.00 plus shipping. We found through our internal analysis that customers preferred the Satin Nickel (Pearl) finish more than the Chrome finish and we decided to only stock Satin Nickel. We will update our shopping cart shortly. In the last 5 years representing this brand and product line, we enjoy continued repeat sales to customers who agree with us that this product exceeds their needs for securing modern (and sometimes older) pocket and cavity sliding doors. 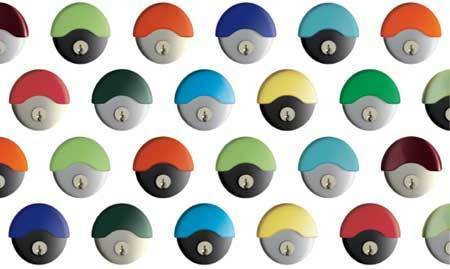 There are a number of electronic locks already on the market that serve the needs of corporate and residential uses. Many of the leading lock producing companies already offer quality products that are competitively priced, that serve functions already demanded by customers. But this does not stop new entrants to the market. This new product attempts to improve upon drawer/cupboard safety and security by integrating the humble smartphone with a new type of cupboard lock. Uses for this product include but are not limited to child safety, waiter/server access control, hospital pharmaceutical carts, refrigerators etc. While the Smart Armor Cube looks like a worthwile addition to our lives, perhaps this first of it's kind version will open the market to more aspiring inventors to improve upon it's basic design. Tapplock is a unique padlock product released recently that offers biometric access control as well as bluetooth smartphone access control. Unique in design, the manufacturer says the internal battery is designed to last 3 years between charges. Tapplock have produced a few different models since the release of their initial product, including a version with replaceable batteries (about 6 month life cycle). Modern access control solutions are slowly converting to multiple authentication protocols, where a user might use their fingerprint and a combination or key to operate their product. Other types of multi-authentication might include the presence of your smartphone to enable a combination or key to work. Check out the video above for this intelligent product and purchase options in the source below. Last week we were called to a project for a local bar/grill where the communal restroom door was a hodgepodge mess left by a previous installer. The door in question was fitted upside down and used a D pull plate fitted to the inside with a surface barrel bolt used as the interior lock mechanism. You can see in the first picture, the exterior door side with the old plates removed, revealed large coach-bolt holes where the old plates were fitted. The inside D pull had been broken off and exposed bolts looked unsightly. They were using a packing box strap to pull the door open, but inspection by the local authority having jurisdiction (AHJ), required a properly operating door handle to be installed. Picture 2 shows another angle of the pre-repaired door. The crack in the door, part way down was the result of a patron kicking the door once to get it open. We removed the damaged plates which revealed the poor workmanship from the previous installer. We decided that the use of 2 Rockwood Push Plates on each side of the door would cover the holes left by the previous products. You can see that we used 4" x 20" push plates and over lapped the bottom plate and top plate. The cross bore hole was in the wrong position, because the door was fitted upside down. The cover plates easily covered most of the damage, effectively improving the aesthetics, expertly. A clean look is a professional look. Picture 4 here, shows the exterior side with the cover plates installed and the high-quality Meroni Nova N12 Privacy/Bathroom lock installed. We were required to drill a 40mm (1-3/4") cross bore hole in the cover plates to accept the new lock. These plates are stainless steel and our hole saws were not sharp enough to easily complete the desired holes. As a consequence, we were required to lace-drill the holes in the plates. Lace-drilling is a term coined by professional metalworkers to explain a method of making a larger hole in an application, when a larger drill bit or hole saw would not work easily. The installer will drill a series of smaller holes in the application and cut the material out to make the hole desired, larger. Picture 4 above shows the exterior side of the door, while picture 5 here, shows the interior side of the door. The customer requested that we leave the surface barrel bolt fitted to the door. Because the door frame was a commercial steel frame, the existing strike plate was located in a different position to the existing cross-bore hole in the existing upside-down door. We were required to accurately allign the new lock with the existing strike plate and drill new cross-bore holes accordingly. You can see the finished look is very professional. The new lock operates flawlessly. The door is a high trafficked door with sometimes hundreds of daily uses, hence the decision to use high-quality hardware. Meroni hardware is uniquely designed with very few moving parts, that reduce the typical wear of many other brands of door knob hardware, making a product that is easy to operate and very long lasting. Below, find a small video of the completed install and the operation of this simple to use lockset. Meroni hardware is made in Italy by a company that produce various different designs of aesthetically pleasing, simple to operate lock hardware. Meroni also is one of the largest furniture/cabinet hardware manufacturers in Europe, with many high-quality cabinet makers and designers across the world choosing their products for their ease of installation, professional look and simple-to-operate designs. Master Key Systems America LLC are proud to represent this fabulous product line in the North American market. The prices are competitive without being low end, ensuring customer satisfaction. We also will supply to various customers across the world, with recent customers purchasing from Ecuador, Chile, New Zealand, Australia apart from our Canadian neighbors. Browsing through this site, will reveal more details and pictures of Meroni hardware products that will provide good looking alternatives to the more mainstream hardware products available. Our sister site, http://www.locksmiths-st-louis.com/ has some articles and videos and purchase options for your consideration. We are a professional locksmith and door repair company providing premium quality products and services across the greater St Louis region. We also sell to other states, cities and countries and can provide quality professional contacts for local installations in those places. Feel free to contact us for expert assistance by qualified and experienced technicians. We have written about a security product called Shattergard, that we make available to discerning customers, a number of times in the last few years and now we read with interest about windows in NYC that use shatter proof glass and how effective they were in preventing widespread injuries in the recent bomb blasts that rocked the city. In the article (in the source below - now since removed) the authors hold that since 9/11, New York City "elders" decided that one way to reduce potential injuries while at the same time reducing the smash and grab crimes of opportunity, was to invest in shatterproof glass and/or products like Shattergard. Shattergard is a product created and sold by Global Security Products out of Atlanta. My friend and colleague Jordan Frankel designs and produces unique security products aimed at minimizing damages caused by criminals that affect our very lives. NUKI is another intelligent creation by some talented German designers and engineers hoping to cash in on the ever growing home automation market. Then operating from your cellphone becomes innate. I see some security issues with this type of product, specifically if the product is damaged or removed from the door, an attacker now has your mechanical key. I will agree that this product might suit internal access control in an established office or dwelling, without the increased expense of modifying an installation to accept a relatively expensive modern standalone access control lock. And in the current economic climate, solutions that provide better value for money, are made from quality and lasting components, more competitively priced alternatives are certainly being sought more frequently by cost conscious consumers who also understand that security, aesthetics and ease of use without a large learning curve, are the solutions many of us want. Bold Security Technologies just recently released their own iteration of a smart lock. But this particular design is somewhat different. 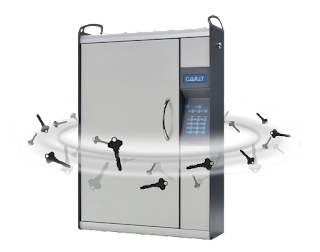 Technologies like this have been around for a few years now, with industry leaders like Salto, already including a similar product in their vast range of high security mechanical and electro-mechanical access control systems. The Bold is trying to secure crowdfunding thru Kickstarter and it may even come off, although at $129 per cylinder and only aimed at the (relatively small and already competitive) European market, it is a tad dear. I think the premise has merits and the idea may even have legs, but competing in an already top-heavy market, with many of the established industry players including Assa-Abloy, Salto, Simmons-Voss and others already producing much broader ranges of smart cylinders that operate across more markets than just the Euro cylinder segment. The market has seen a number of recent entrants, all vie for share, including August, Kevo, Lockitron to name a few. One of our signature product lines Meroni, are knee-deep in R&D to bring their nouveau, modern style product line of unique door hardware into the "smart" family. Meroni are perfecting their recent auto-magnetic latch mechanism design, that already provides an almost silent and hidden latch mechanism, with a system that can be locked and unlocked by smart-devices (cell phone, proximity device, etc). We are anticipating a release of late next year on the Meroni. It is with deep regret that we unhappily announce that our recent computer catastrophe has rendered our database 99% unrecoverable. This means that all our high security restricted key system data has been lost forever. The computer failure was sudden and unexpected and compromised our backups too. We apologize to our many clients who trusted us to maintain these records. NOTE: None of our systems have been compromised or lost to hackers or stolen details. We have simply lost the intellectual data. That means that all systems already in existence are still secure. We just cannot access any of the data required to produce new key copies or generate new cylinders keyed to existing cylinder loadings or run reports of current quantity of issued keys. Each System's Contact Information, including all recorded signatories have also been lost. We will try to contact some clients to update their authority signatory forms and enroll the systems in our new updated and backed up (in multiple locations including the cloud off-site) software. To our customers, if you require additional keys or any service on your systems, we will require to view an image of all your different existing keys in your system. This way we can rebuild the database by hand and can service and update your systems. We apologise again and thank you for your understanding. The locksmith and door hardware industry is not immune to financial pressures. Many industries are increasing their prices even though the wider economy is not experiencing inflation. What is especially interesting is that while these manufacturers are increasing their prices, they are not increasing wages and compensation for their employees. While the greater economy shows that American employers are continuing to offer more jobs and increase hiring, wages are stagnant and in some cases actually dropping. The above manufacturers are mostly companies that produce their products off-shore, where the economies abroad are not seeing the growth of previous years and prices have by large not increased. So why are they increasing their prices? probably due to shareholder demand! Will local service providers also increase their prices? Most likely not but they should. A couple of years ago we reported about the GM Ignition Switch fiasco that was taking place across the country, in the wake of repeated mechanical problems suggested to be directly and indirectly caused by faulty ignition switches. In a new article in USAToday, a Texas jury has sided with GM in a closely watched court case where the car maker was sued over a supposedly faulty ignition switch. The particular case (see article in source below) was about an accident that occurred where the occupant lost control of the vehicle after hitting the key switch with their knee. The jury found that case investigators determined through extensive research, that the driver was driving recklessly at the time of the accident. This does bring into question the legitimacy of other claims of impropriety by the car manufacturer and does suggest that they are not at fault like previously thought. The Touch Lever Lock by Locksis, a Korean manufacturer of unique door entry products is making it's debut to the door hardware market. The video above gives a glimpse of this very interesting product, aimed at reducing the reliance on mechanical key products, while maintaining security, aesthetics and convenience to the access authorized. The fundamental difference with this new product, compared to similar products in it's genre, is the use of high grade stainless steel providing ease of use and quality for internal and external environments. Stainless steel is well known to provide better functioning and protected internal mechanisms especially when used outside. This product looks quite functional and easy to install. The benefit that external battery connections provide include easy access from outside if the internal batteries havent been replaced (like could happen if your dwelling has been unoccupied for some time and the internal batteries have not been replaced). With no mechanical override key, there is no key to lose or worry about being copied without your permission. The provision of a master code and an operating code, allows for easy changing of the combination, further protecting users. A unique and modern approach to the deadlatching function enables this product to act like a deadbolt and latch mechanism in one product, eliminating the need for a handle and a separate deadbolt. We hope to be able to offer this product in due course. Our very popular Lockwood 7444 Keyed Pocket Door Lock is selling fast. The new model is here and now makes this lock able to install to 1-3/4" thick doors too, without any special drills required. With increased shipping and import duties we have been required to marginally increase the unit cost, even though the manufacturer has not raised their prices. The product is available now for only $128.00 plus shipping. You can purchase the product at our sister site or by visiting the link in the source below. We choose to ship with UPS in the continental United States and the shipping fee is for UPS ground. Greater quantities incur higher shipping fees. To Canada and off shore states and territories we choose to ship with USPS with the average delivery time of 7-10 days. Please remember that all shipping requests out of the country require your contact telephone number be included. We suffered a monumental catastrophe at the beginning of July that caused us to lose much of our data. Our backups cannot be used until we rectify our hardware issues and we are working to correct these problems as soon as possible. We thank you for your understanding and patience and apologize for the inconvenience. As informed, we happily announce our receipt of the new and updated Lockwood 7444 Keyed Pocket Door Lock. This new updated model replaces the older version and is now designed to also work on 1-3/4" (45mm) thick doors too. The former version will only work correctly on 1-3/8" (32mm) thick doors but it could have been used on thicker doors with a little door modification. The new version has been modified using a stronger and modified connecting tail, inside the mechanism that allows for the one product to be used with doors up to 1-3/4" (45mm) thick. The manufacturer have seen fit to maintain the cost at the previous price point, enabling us to offer the newer product without a price rise, although shipping and customs rates for importing products from abroad have seen a marginal increase, which we have to pass on unfortunately. Unlike another vendor in California who is offering the same product, but suggesting to purchase a special drill for installing to the thicker doors, our new offering enables simple installation without door modification. Israeli startup Zore, have produced this new sensational security product aimed at protecting us (the free citizens of the world) from gun violence that is rapidly taking over our society and culture. This intelligent yet simple to apply and operate attachment, will find it's way to gun stores, police departments, shooting clubs and probably anyone concerned about the safety of their families. The short video above shows how it is applied and why it is effective. I personally refuse to own a gun, but I also believe in freedom to choose for yourself and support the second amendment to the USA Constitution as it is written (not as it is understood). The safety and security of all people is at stake here and products like these will help to prevent more "crazy" actions, while protecting your individual right to gun ownership. Electronic security devices are quite the rage today in the security field with many companies offering variations of key fob and card key systems aimed at supposedly increasing the security access control of residential buildings and where we live, work and play. Notorious current affairs program on the Nine Network in Australia, A Current Affair, recently produced a video segment where they caught up with a perpetrator, operating a scam to copy and reproduce the electronic key fobs and swipe cards that are supposed to be restricted and giving them to customers all across the Sydney and other metropolitan centers for a fee. The issue presents a moral and ethical quandary because, as residents or dwellers of abodes, people often want to share access to their residences where many management companies often refuse to provide additional copies of electronic access control fobs and cards or,if they do, charge outrageous prices for even legal tenants of these dwellings to obtain working duplicates. Tenants are often coerced to find more nefarious means to bypass the legal owner/operator of these security products and gain access to desired locations. The legitimate locksmith industry across the world has been repeating similar messages for many years, that the perception of these "electronic access control products" providing better security and access control, is nothing but a fallacy. Yet the legions of building contractors and management companies simply turn a blind eye because they want their cake and to eat it too. Legitimate locksmith companies have been offering restricted mechanical key control systems for decades. Systems like Abloy, Bilock, Evva, Primus, Multlock, Medeco etc, that produce operating mechanical keys that are virtually impossible for non-authorized people to obtain duplicate keys. In the source below find a link to the video of this particular video segment where a reporter is hot on the tail (literally) of a scam operator who is selling inappropriately obtained duplicate tags for operating access control systems. The same systems where many people think they are in a secure building but unfortunately, as this video proves, they are not. For a limited time (until stocks run out) we have reduced the price of the Lockwood 7444 keyed Pocket Door Lock. This model is being replaced by a version that will install to 1-3/4" thick doors too. It is only available though this link. Pertinent information to any webmaster that provides vital information to determine how well your site is progressing, is an integral component of any marketing management program for any business. Our latest statistics are captured above in the image provided and show that this site is maintaining a reasonable amount of web penetration. Now, what does this information mean to a business owner? This information helps a business owner determine the popularity of website posts and provides engagement statistics that enable one to better determine the types and styles of posts that most interest our readers. The information above is an indication of the number of pageviews our site has achieved for the dates tabled. These are NOT the number of hits to the site. These are the number of pages that viewers peruse and may be from a significantly lower number of individual hits. Many webmasters use search engine statistics to determine the value of a site, but many seem to only judge a site's value on the number of individual hits their site(s) receive. That unfair assessment of your sites value often can lead to over saturation of content, in attempt to bolster your numbers. Engagement and site quality is better measured by the number of pageviews, because this indicates that your landing page may be creating enough interest in the reader for they to mosey around the rest of your site, reading additional articles, moving between pages etc. These actions directly power your sites credibility and authority with search engines and can be a contributing factor in having your site listed higher, naturally, in search engine results. Without knowing the actual algorithms that search engines like Google, Bing, Yahoo etc use to provide content to searchers, a webmaster needs to design their site based on content and optimisation. For many years the optimisation industry has developed to provide services to website owners aimed at improving their websites search engine penetration. Like others we continue to receive multiple calls, sometimes daily, from companies wishing to sell us "first page ranking on search engines". We have chosen to say NO to all of these companies because we believe the value of our content, provides better engagement to our readers that search optimisation has ever brought us. We understand that optimisation companies want to/need to make money too and they offer (the lazy website owner) some quality products and services that can help a site progress up the search engine ranks. It's up to you if you want to pay for the white hat techniques to propel your site/s. We choose to simply provide better content. This is reflected in our statistics above. The Fabulous and in demand Keyed Pocket Door Lock by Lockwood, the 7444 SPDP and it's cousins, the passage 7450, the passage latching 7410 and the privacy 7450 have all been updated to enable installation to thicker doors, meeting demand from around the world. This means that the new model will be able to be used on doors from 32mm thick to 45mm thick. Persistent and continuous inquiries have been flooding in requesting this lock to be used for 1-3/4" thick doors. Until now, we have only been able to sell the 1-3/8" thick version, which typically works on standard pocket/cavity doors found more often across the market. As a SPECIAL to our customers we will be reducing the price of the older version from the current $125 plus shipping to $80.00 each (plus shipping) to clear our excess inventory. we expect this change to occur, early next week. The new model we expect to make available toward the end of August and expect the price to return to the current level. Unexpected issues, require us to travel interstate at last minute. We will close until Wednesday afternoon. We apologize for the inconvenience and thank you for your understanding. CompX, a maker of a wide range of cabinet furniture lock products and hardware recently came out with this novel modern approach to securing double casement cabinet doors. The product is straightforward to install and operates natively without the need to operate an elbow spring or necked bolt, which were the traditional ways for securing cupboards of this type. I recently installed a few of these for a client who understood the benefits immediately. I also installed a number of Meroni 2630 Screw On cupboard locks keyed alike. The combination of these products look professional and are extremely simple to use and operate. The Meroni 2630 Screw On Cupboard lock is available in Nickel Plate Or Black finish with a 20mm (1-5/8") long cylinder that will fit a standard cupboard door. Able to be keyed alike, keyed to differ or master keyed. They cost about $17 each and are quick to install. The Lockwood 7444 Keyed Pocket Door Lock Is Selling Like Hotcakes! The Lockwood 7444 Keyed Pocket Door Lock continues to defy and break sales records for our small company. The product is especially difficult to keep in stock or on the shelf. Few options exist that make a high quality lock for pocket doors, especially something stylish, easy to install and competitively priced. And with Lockwood about to release the new version tailored to suit 1-3/4" thick doors, we expect an avalanche of orders in due course. Our last shipment of the current model came in a month ago and we have sold almost half of our inventory already. Available exclusively here at Master Key Systems America LLC, through our sister site locksmiths-st-louis.com you will not find it elsewhere in North America. We have recently sold product to Guam, British Columbia, Montreal, Quebec and some other far away (from me) destinations and in over 5 years of representing this product we have not heard of one product failure. If this product suits your discerning needs, please click on the picture in the top left side of this site and be directed to detailed explanations of how it operates, the ease of installation and your shipping options. Assa-Abloy Asia Pacific - Lockwood Australia have decided to introduce their new Key Deposit product to the wider market. A key deposit is used for storing route keys for apartment buildings, office complexes and factories, enabling secured access to authorized key deposit key holders. Okay! That's a mouthful to consider. Route keys can be of use to utility companies such as electricity, telephone, gas or cable TV companies as well as fire departments. The key deposit tube is designed to house the actual operating key for a particular door or series of doors. 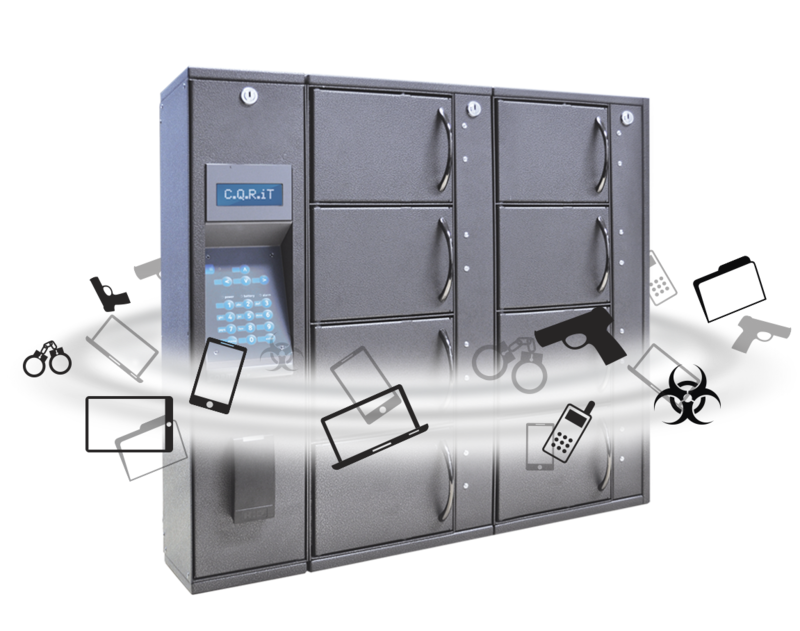 This enables authorized key holders to have secure access to just the room/s they need to access and reduces the need to hand out extra duplicate copies of keys. Simply unlock the key deposit tube and use the key, when finished put it back in the wall. In the brochure (in the source below) there is a diagram that shows what I am talking about. Assa-Abloy Asia Pacific - Lockwood Australia Proudly release the latest upgrade to the Australian industry standard commercial mortise lock range. This is a complete redesign of the product that has been the industry standard in the southern hemisphere for over 50 years. They make models for both standard wooden or metal doors and for aluminum shopfront type doors. The research and development of these new products is the result of many hours of research and development in conjunction with industry professionals, customers, locksmiths, security product installers, educational institutions, hospitals and hotels. The video below explains the new products in greater detail and clarity. I happened to stop into my local supplier IDN Hoffman in Creve Coeur the other day when in walks Scott with Ian Cooke in from Canberra, Australia with CIC Technology. Now, two Aussies in St Louis is a rare treat in the same room. We got to chin-wagging and he introduced me to this fabulous Australian designed and manufactured C.Q.R.iT range of electronic key cabinets and lockers. He opened the door and there was a Bilock key inside. We are the leading Bilock Extreme Security dealer in the Midwest. We have continually dealt in Bilock products for 25+ years worldwide. The first version is the key cabinet above. The locker here is state of the art. Especially tailored to hospitals, schools, colleges, car dealerships, institutions, corporate security is now enhanced to it's finest. Watch the video to understand the benefits of key control and how it helps you. The options are endless with this multi-authentication product. We have talked about the fabulous Meroni UFO+ security product a number of times in the recent past and shown installation videos and operations. The above video is a short version of the extended test display, that demonstrates the prowess of this kind of lock system, especially designed in consultation with commercial truck/van manufacturers over a few years. The Meroni UFO+ is a unique and stylish lock product that prevents malicious entry to your property, while in your truck/van. The interior release cable, allowing for quick and simple egress/escape from inside, separates this product from many competing brands that simply lock the outer doors. Having an interior release function prevents an occupant from being locked inside easily. The product is incredibly secure, using high-security virtually pick proof, virtually bump proof and virtually copy proof keys. Able to be master-keyed in groups, like for fleet vehicles, the Meroni UFO+ is the most sought after van security product and the strength and reliability is just one factor that FEDEX and TNT and UPS have chosen as their "go-to" security product for their delivery trucks and vans across Europe, Asia and the Middle East. First released to the USA market last summer, the product is hard to keep in stock because of the demand for better van/truck security. Definitely not a cheap "fix" product, the Meroni UFO+ sells for about $325.00. Installation is straightforward, although we do suggest a professional installer complete the project, to maintain warranty. Yale is known worldwide as one of the oldest lock manufacturers in the lucrative North American Market. Yale products have been continually built since Linus Yale patented his original pin tumbler mechanism back in 1865. In recent years, the advent of "The Internet Of Things" has opened up many industries to the technological revolution. The large technology behemoths like Apple, Google, Microsoft to name a few, have capitalized on this technology boom with products like the iPhone, Android etc to make all people lives a little more "connected". Many industries including, thermostats, alarm systems, web cameras, lighting switches and door locks have seen the new IOT "smart tech" be embedded in their products. Virtually allowing most of the devices and gadgets that surround our lives, to work together seamlessly. There are already a great many options to choose from in the $30 Billion home security market with many "new-age" smart locks already gracing the shelves of locksmith shops, hardware stores and online e-commerce websites. The Entr by Yale, looks like yet another entrant to this crowded market. The video above shows the product developed for the standard European market, but I am lead to believe that similar models are being produced for the North American market too. I think the product looks pretty good. Dont you? Why Is Re-keying Your Home Locks Vital And Important For Home Security? Pictured here is a typical front door entrance set found commonly across the United States. Many customers we visit, ask us to re-key their locks. It is one of a locksmiths principal service offerings. But why is it a vital and important project upon buying, renting or moving to your new home, to re-key locks? In our vast 35+ years of experience across four continents, we have re-keyed a great many lock systems for our customers. The obvious reason for re-keying your locks, is to lock out a key holder. We attend many customers who rarely think to re-key their locks when they first move in to their new home or office. Many seem to think that previous owners or tenants have returned all the operating keys and that full disclosure indicates there are no additional operating keys "out there". But time and again, we find that many homeowners are unaware that many of their new locks, installed by the building contractor, are in fact master-keyed. The reason their locks are master-keyed is often a building contractor or home construction company, will build more than one or two or three houses in a new locality and to minimize the number of different keys that each of their tradespeople are required to carry, to access each different property, the builder will order direct from the manufacturer, all their locks keyed to their master system. The builder will obviously hand over the individual operating keys for each new property to the new owner or agent, but many new homeowners are unaware that their new locks are actually master-keyed and will often delay or forget altogether to ensure no-one but they have keys or copies to their new home. Perhaps they are lured into a false sense of security that their new home is secure because they have original keys in their possession? There are some builders who operate with integrity and install Construction Keyed locks to doors. And these builders will also instruct the customer to insert their individual operating key to all their new locks and in so doing, their construction keyed cylinders will naturally and automatically "switch off" the construction keying function. 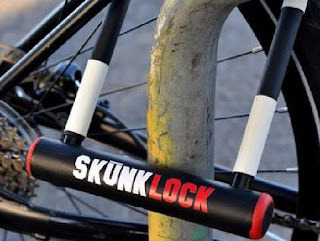 We just came from another customer where we re-keyed their locks. In dismantling the cylinders we discovered master pins in multiple chambers, indicating (most likely) that these locks have never been changed, since original installation. Now, here is the rub! How Do You Prevent Being Locked Out Of Your Home? As a practising locksmith for almost 35 years across the planet, I have attended a great many "lock outs", rescuing stranded customers who are locked out of their homes or office buildings. The skills that a professional locksmith brings to bear, include the special training in learning the art of picking locks. These days, with the advent of online video sources, more and more videos are appearing daily showing people, including locksmiths and hobbiests displaying their prowess at picking locks. There are few brands of locks available that are particularly difficult to pick/manipulate, presenting increased challenges to would be lock pickers. Some of these brands include (but are not limited to) Abloy Protec, Assa Twin, Multilock, Bilock, Medeco, Primus and others. Few are bump proof and virtually pick proof like Protec or Bilock and the industry is constantly evolving to produce better mechanical "mousetraps" aimed at increasing the security of our homes or offices. But, the pain felt when you accidentally lock yourself out and the sometimes long wait for the professional locksmith to attend and rescue you, can be mitigated using a hidden key safe. There are a number of versions available in todays market and one worth considering is pictured above. A simple water sprinkler with a cavity and screw on cap, that can hold a couple of spare keys is a painless and inexpensive method that would be so helpful to some people. Locksmiths would probably prefer i didnt mention products like these, because these types of products could reduce the calls for professional locksmith services. I dont really care all that much as i am in the business of "Securing America - One Door At A Time" and the interests of my clientelle and their families are more important that a few quibbling locksmiths. And if i can save you a couple of bucks and some extra time and inconvenience, then why the heck not? These dummy sprinkler heads can be purchased just about anywhere but Amazon have them fairly cheap. Lockwood Australia recently released their new fire rated nightlatch, the Lockwood 507. Designed to withstand 4 hours of fire and rated accordingly, this new product is constructed using high-quality 304 Grade Stainless steel. Installation is simple and straightforward and a perfect solution for utility cabinets, service cupboards, janitors closets, etc. The latch mechanism is also fire rated and also constructed from 304 Grade Stainless Steel, as is the lock body/case and strike plate. 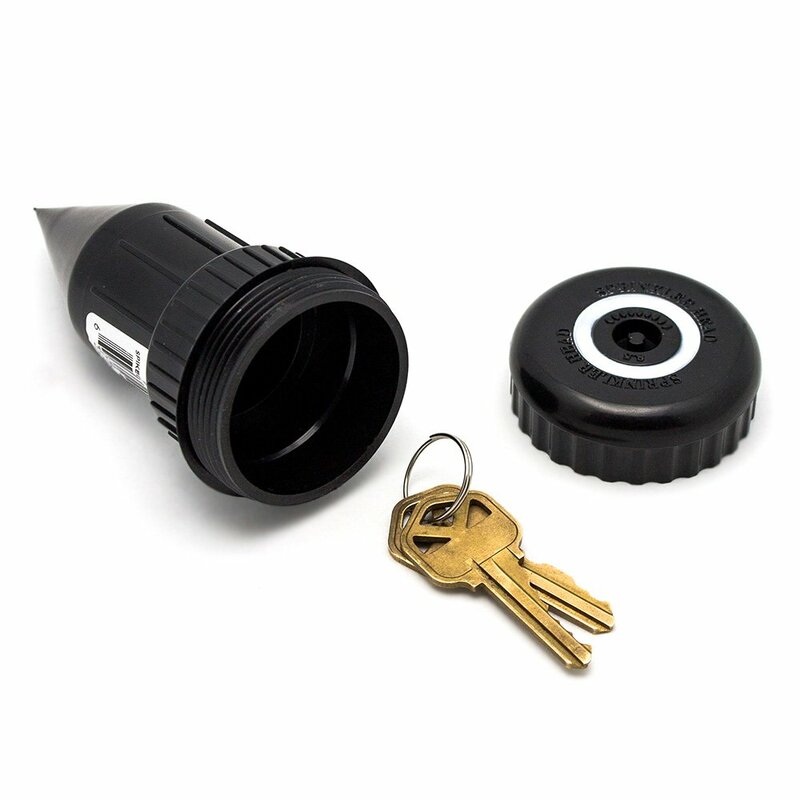 The product is supplied without an external cylinder ensuring the ability to use with an existing master key system. The lock mechanism has been tested and certified to 500,000 operations and is corrosion resistant for up to 168 hours, neutral salt spray ( that means testing involved direct spray of seawater for 168 hours). This makes this an ideal product for use in coastal regions, river-side buildings etc. The product is of sufficient quality that the manufacturer warranties the product with a 25 year mechanical warranty. Available soon by special request to North America. Here is an image of the issue we faced. The existing mortise lock handle hardware kept falling off due to overuse. The install was painless and straightforward. We used Don-Jo renovator kits to modify the edge fittings. We also installed Rockwood Push Plates to cover the existing holes left by the old hardware. Now, they dont even need to use a dirty hand to operate these handles. they can pull the doors open with their arm easily and push them open from inside, even when their arms are full of parts from the supply shop. UPDATE: Our fabulous and in-demand product, the Lockwood 7444 Keyed Pocket Door Lock is now back in stock, with new inventory having just arrived. We just updated the purchase page and thank our customers for their patience. The new model, tailored to suit thicker doors of 1-3/4" (45mm) has not been released yet, although we are informed that they will be available about August. We expect to have new supply of this new model shortly thereafter. The quantity of inquiries we are continuing to receive for the in-stock Lockwood 7444 continues to surprise us. The recent inquiries for the new 1-3/4" door model is exceeding our expectations. Many customers across North America have 1-3/4" thick doors and some have purchased the 1-3/8" version, thinking they could just adapt it to suit the thicker doors. They can, although installation requires a little modification to your door for perfect fitting. Until the newer model is released, we suggest purchasers who wish to install to the thicker doors, countersink the crossbore holes about 3/16" from each side. 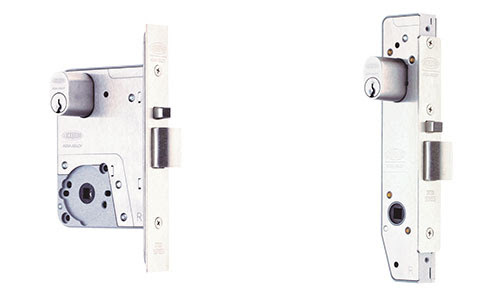 This will enable the lock body to seat correctly in your door and make connecting the screws simpler, with the activation mechanism correctly activating the bolt mechanism. To purchase, simply click on the product image at the top left of this page and be directed to our sister site with purchase and shipping options. Thanks again for the continued interest and your patience. 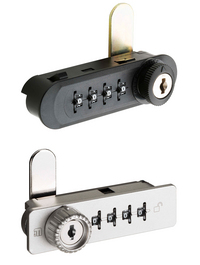 Bilock Exclusive - New Updated Bilock High Security, Bump Proof And Virtually Pick Proof Key System. 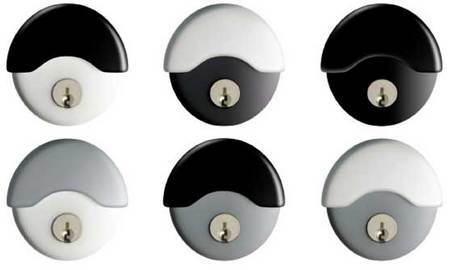 These are the color ranges of the new Bilock Exclusive key system. We previously mentioned that Bilock would be releasing their new product that offers increased patent protection right through to 2035, in a December article. The new product dramatically increases the security of the system, while doing away with the trigger system in the New Generation system. The New Generation system used a single side-bar blocking pin and 13th pin to increase the pick resistance of their previous offering. The patented Quick Change core removal system has been completely overhauled and is now way more effective than the previous iteration. There is a video in the source below that explains all about this new and improved system. Essentially, Bilock have replaced the trigger system with a more effective double-action trigger system that does not require a separate trigger. The new system uses specifically coded side pins that engage the side-bar in a unique fashion and directly increases the pick protection. Previously, any key could have been converted into a core removal key. The new style makes a purposely designed control key to remove and replace cores. Master keying is still available with up to 17 million potential key changes in a system. The older New Generation system is still available for purchase and still being produced and we continue to build these systems for our discerning customers. The other updated component of Bilock Exclusive is the addition of MiFare chips that can be embedded into the key-heads to operate effortlessly with many modern electronic access control and alarm systems. For an in-depth explanation of the new Bilock Exclusive product, click on the source below and watch the video at the bottom. Breaking News!! Lockwood Australia, the Assa-Abloy manufacturer of the leading door hardware products in the southern hemisphere will release this coming July, 2016, another adaption of their fabulous Keyed Pocket Door Lock. The Lockwood 7444 Keyed Pocket Door Lock (pictured above) has been on the market about 5 years now and our sales have continued to be stellar in the wider North American market. Many discerning customers, across the Americas have realized that once in a while a product surfaces that changes the world. Remember Apple's iPhone? or Google's Android OS? Many modern manufacturers capitalized on the Google owned operating system releasing competing smart-phone products in the mobile/cellular phone arena. We started selling the fabulous Lockwood 7444 Keyed Pocket Door Lock a little over 5 years ago and have enjoyed stellar sales, thank you. As shown in the video on our sister site, the ease of installation of this superbly designed product, answers the needs of many customers hoping to secure their cavity/pocket doors. We have happily sold many hundreds of this product over the last 5 years and so far, luckily, we are yet to receive any negative reviews. Yes, we have honored the warranty twice for people who have chosen to return the product for a refund. We have once had to provide an extra strike plate because of an installation error. We have done so, because we believe in our product offerings and feel our reputation for quality is proven by the products and services we provide. 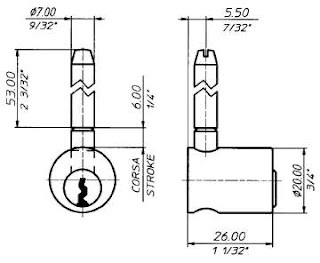 Lockwood made me aware recently of their intention to finally release an identical version of the Lockwood 7444 Keyed Pocket Door Lock but for 45mm/1-3/4" thick doors, answering the call from a great many inquiries to that effect. They anticipate a late July, 2016 release and we are hoping to have inventory around September or October 2016. Stay tuned for updates. We will release additional news as soon as it comes to hand.